Rea, J.e.. "Sir Rodmond Palen Roblin". The Canadian Encyclopedia, 04 March 2015, Historica Canada. https://www.thecanadianencyclopedia.ca/en/article/sir-rodmond-palen-roblin. Accessed 23 April 2019. 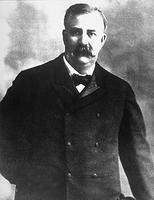 After 10 years in and out of politics, Roblin succeeded Hugh John MACDONALD as premier in 1900. Under Roblin Manitoba created a successful government telephone system and established the first effective public utilities commission in the nation (courtesy PAM/N-10863). Sir Rodmond Palen Roblin, businessman, premier of Manitoba 1900-15 (b at Sophiasburg, Canada W 15 Feb 1853; d at Hot Springs, Ark 16 Feb 1937). Roblin, of Dutch Loyalist stock, completed his education at Albert Coll, Belleville, Ont. When he arrived in Winnipeg in late May 1877, he turned his hand to various business endeavours in Carman and in Winnipeg and to local politics. On his second attempt, he won election as an Independent MLA in 1888. The paramount issue of the day was the &QUOT;monopoly clause&QUOT; of the CPR charter that gave the railway a stranglehold on western transportation. Roblin, as a strong provincial rights advocate, gave his full support to the GREENWAY government's struggle to overturn the monopoly, but he was hostile to Greenway's scheme for bringing the Northern Pacific Ry into Manitoba without rate control and to his government's failure to forward the plan for a railway to Hudson Bay. With the sudden death of John NORQUAY, the Conservative leader, in July 1889, Roblin's prominent and effective opposition to Greenway's railway policy made him a popular choice as the new Conservative chief. In the dramatic session of 1890, Roblin denounced Greenway's repudiation of his government's recent guarantees to the Catholic minority not to disturb the language and school laws of the province. But Greenway weathered the storm and retained power for the rest of the decade. After 10 years in and out of politics, Roblin succeeded Hugh John MACDONALD as premier in 1900. He assumed the portfolio of railways himself and made a startling agreement with the Canadian Northern whereby the railway completed an alternative route to the Lakehead and vested control of rates in the provincial government. Roblin always considered this his greatest achievement. 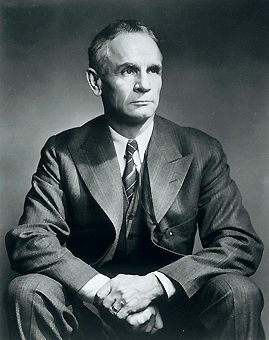 Under Roblin the province bought out the Bell Telephone Co, created a successful government telephone system, and established the first effective public utilities commission in the nation. His attempt to institute a publicly owned system of grain elevators, in response to farmers' demands, was a disastrous failure, but his government did introduce a workmen's compensation law as well as corporation taxes. The Roblin &QUOT;machine,&QUOT; as it was called, played an important role in the federal RECIPROCITY election of 1911 that turned out the LAURIER Liberals. With Robert BORDEN's Conservatives in Ottawa, the boundaries of Manitoba were finally extended and the premier became Sir Rodmond, a not unconnected series of events. While Roblin was not directly implicated in the scandal surrounding the building of the new legislature that brought down his government in 1915, he shared in the political odium and resigned to return to business. H.R. Ross, Thirty-Five Years in the Limelight: Sir Rodmond P. Roblin and his Times (1936); W.L. Morton, Manitoba: A History (1957, 2nd ed 1967); James A. Jackson, The Centennial History of Manitoba (1970).